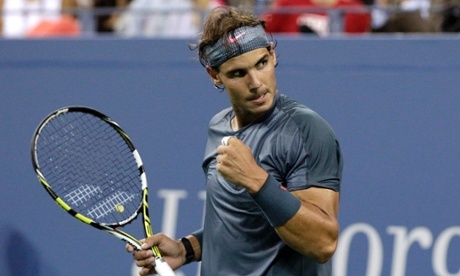 Rafael Nadal is certainly the best tennis player in the world right now! In this year's US Open final, Nadal worked hard to get the win, and he electrified the audience with a breakout performance. People were left staring in awe at a player who was totally transformed from last year. He had to leave then with an injured left knee, not even finishing his games. It’s even hard to believe he was the same player that was washed out of the first round in Wimbledon by a player who was ranked 135. But the total turn around certainly made for thrilling tennis, there’s no doubt about that. Nadal is currently ranked number 2, and he managed to get by the number 1 ranked Novak Djokovic in a 6-2, 3-6, 6-4, 6-1 match. Nadal was quoted as saying, “Very, Very emotional, no?” during the ceremony, and I can hardly argue with that. In a comment on Twitter, one person commented that the game was “like a movie,” and they cried at the end. As usual, in every great tennis match, there are many lessons to be learned. Here are my perspective and my post match analysis. "It is true that I am playing a little bit more aggressive than before, more inside the court, closer to the baseline, going more for the points. But for the rest, everything is as usual," said Nadal. What I observed about Nadal in this US Open final are that he made good use of his strength, which is his lefty forehand to pull Djokovic to his backhand side. Once he saw Djokovic was being pulled out wide, Nadal will go for a forehand down the line winner. This strategy has worked perfectly well for Nadal even against other opponents. I also find that his backhand slice helps him to stay in the point longer. Given Djokovic's penetrating groundstrokes, Nadal was able to absorb everything that the Serb threw at him and counter when there were opportunities. Both Nadal and Djokovic are known for their never die strategies, going after every single ball. As a tennis coach, it’s always thrilling to watch the pure fitness and effort approach really paying off. It looked like Nadal’s knee had finally fully healed, since he didn’t have to tape on it anymore. He did not have any real trouble moving around, given just how much court he was able to cover. “I tried to keep fighting for every ball, be focused in every moment,” Nadal said. Indeed we always know that Nadal is well known for going after every ball. His fighting spirit played a significant part in winning this tournament. So what can we learn from Nadal? I always try to tell my students, that it’s important to go after every shot, to give every shot a try no matter how hopeless it might look when it first starts coming in. It can be emotionally and physically exhausting to try to go after every shot, but it can really make a difference in terms of momentum in matches, and this match shows the truth of that in spades. Another thing I try to get across to young tennis players is the importance of cutting down unforced errors. It’s entirely possible to beat an opponent who is faster, stronger, or more skillful with shots than you simply by outlasting them and committing little unforced errors. If you don’t beat yourself in tennis, then you will force your opponent to do it. You will force them to make shot after shot to beat you. If you don’t defeat yourself, there’s always the possibility your opponent will sink themselves with unforced errors. Tennis is a game of endurance and personal control much more so than other sports. This match was a good example of this principle. For example, Djokovic was much more aggressive than Nadal in the last 3 sets. He hit 46 winning shots as opposed to the mere 27 winners that Nadal hit. So, Djokovic hit almost twice as many pure winning shots than Nadal. Anyone looking at this fact alone might think that Djokovic would be the winner of the match. But tennis is about much more than just winning shots. Nadal has only 20 unforced errors, that is, errors that cost him a point in a situation where he wasn’t really pressured at all. Basically, they were nice, easy shots that he happened to miss. How about Djokovic? He had 53 unforced errors. Read that again, fifty-three. That’s almost three times more! Nadal won the match partly because he had better control, and he didn’t give up or make errors without being forced into them. In essence, he let Djokovic beat himself to a large extent simply by having more physical and mental endurance and self-control. In this match, there were plenty of long rallies. Besides the importance of physical endurance, the mental side of it must not be neglected. I feel that Djokovic seemed to lose his concentration in recent big matches. In the last year’s US Open final, he won the third and fourth sets against Andy Murray, had the momentum but lost the fifth 2-6. In this year’s French Open semi-final, he was a break up against Nadal in the fifth set and lost. In the Wimbledon final in July, he was a break up against Murray in two sets and lost. In this US Open final, he was a set-all and a break up and lost. Endurance and self-focus matters, and as a tennis coach this is something I try to instill in my students over and over again. You can’t just focus on getting the winning point every time. Think of how to turn around the match when it is going against you. Focus on the next point rather than thinking ahead too much. The above points were my thoughts when I watched the US Open final. It was a marvelous performance from both players, and while the endurance and focus of both players was astonishing, it was Nadal who carried the day simply by going longer. Let's enjoy the highlights of the US Open final once again. If you have any comments, feel free to leave them in the comment box below. I will look forward to hear your feedback. From "US Open Final 2013: My Post Match Analysis" To "How To Play Tennis Efficiently And Become A Better Player"